Shown here: cove/eastZ layer 34, February 19, 2006. Pieces by Katz and Dest. I’ve added nine new layers to the “cove” wall, featuring pieces by Aera, Ashes, Dest, Drsk, Flows, Ghana, Grail, Jas7, Katz, Rome, Siez, Skan, Swef, Zel, and a few others whose names are beyond my ken. If you look closely you might also catch a Mear One tag in there. Running 34 layers deep, this is now by far the thickest wall in my archives. Jonathan Tobin recently created a Flickr group for photos of the Belmont Art Park in Los Angeles. Scott Garner added some photos he took during a film shoot he was working on (one of many that used to happen at that location). I thought it’d be fun to show a little before-and-after on one of his photos. Above is the original photo, and below is how it appears in grafarc. The perspective warp, which was necessary to make the front of the building line up with the other layers, ends up distorting the people and equipment quite a lot. Shown here: belmont/building layer 4, April 25 2004. Photo by Scott Garner. I’ve also added another of Scott’s photos from the same date to the belmont/tunnel area. Shown here: bluxome/eastC layer 7, March 2001. Photos by Peter Merridew. Artists, from left to right: QUAKE, CODEAK, APEX. Going through my archives of photos scraped from the web, I stumbled upon some missing layers from the Bluxome alley. 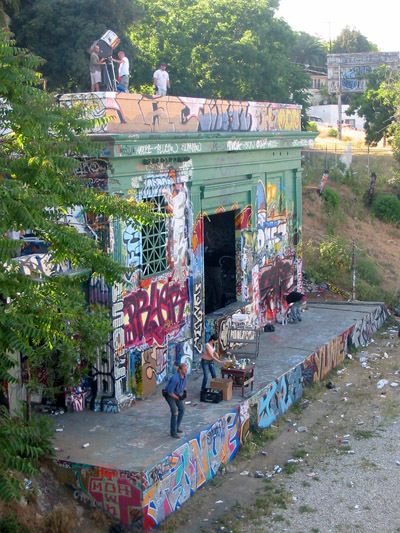 Appearing under “bluxome/eastB” and “bluxome/eastC” are five new layers of photos, courtesy of Peter Merridew, Susan Farrell, and Maseo on Art Crimes (the web’s original graffiti site, an amazing resource in case you didn’t already know about it). The new layers fill in some gaps in the period from 2000-2001 (during which I didn’t take nearly enough pictures) and feature work by BLIS, GIANT, APEX, NEON, CODEAK, SHIME, QUAKE, ZORE, and others. 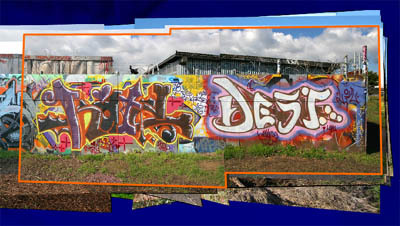 This brings the site’s total count to 217 layers, distributed among 22 walls from 10 locations. This is still only a small fraction of what I have to share. I’ll do my best to keep updating the site with new material as time allows! Okay, this may be the coolest little hack I’ve ever seen, and simple enough that even a non-engineer like me could do it: LED “Throwies”, brought to us by Make Magazine. 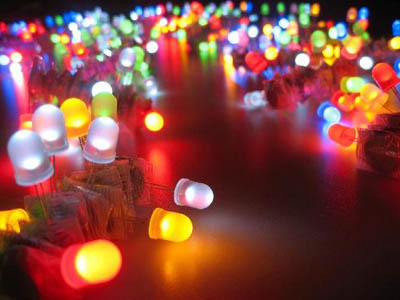 They’re basically little LED lights connected to a battery and a magnet, which you can attach to any ferromagnetic surface simply by tossing it at it. Ever wanted to see your name in lights? Now’s your chance! Be sure to check out the excellent video by Resistor and Fi5e. Finally, at long last, the middle of the east wall on Bluxome alley is ready! I had the left and right ends of the wall finished a while ago, but this center section has seen a lot of action over the past seven years, and it took some time to put it all together. Hopefully it was worth the wait: this section features not one but six different pieces by APEX, as well as work by ATOM, IVORY, BLIS, ZORE, SEAK, DAIM, MARS-1, PICASSO, PERSUE, QUAKE, AEROE, SPOZE, POSH, and others. That’s fourteen layers of mind candy for your screen-sore eyes. Watch this space for more updates… now that this wall is done, I can start going through my hundreds of photos from the other wall.